The thing I admire most about the education reform movement is their brilliant co-opting of language. They use language to frame their manifesto in a manner that is extremely difficult to counter-argue. Take, for example, their heavy reliance on phrases like “Quality schools for all kids” and “We think all kids can learn.” How are you going to counter that? With “Some kids can’t learn” or “Sub-par schools for all”? I don’t think so. And so the reformers play into America’s irrational fear of teacher’s unions by attacking them while glorifying the people who make up the teaching profession. I know, I never said it made sense; just that it was well crafted. Their biggest coup, though, may be in getting people to refer to them as reformers when they’ve shown little ability to reform anything. Look at their main vehicles. As the research continues to come in, a picture is beginning to emerge of charter schools being about as successful as traditional public schools, but a whole lot more disruptive. Cyber charters are performing so badly that even the National Alliance for Public Charter schools is attacking them. Teach For America, the organization that was intended to get a “high quality” teacher in front of every child, is morphing into a social organization and relying on cheap PR stunts since recruitment is down 35%. Achievement School Districts that were going to bring the bottom 5% of schools up to the top 25% percent are now being shown to be ineffective, and schools are being returned to local school district control. In fact, the only things you could say they have truly reformed are school board races. Used to be 10k and some knowledge about education could you elected. Those days are long gone and the money has become astronomical. All in all not exactly a great body of work for reformers, I’d say. You’d think with this kind of success rate, you might want to look into another arena to lend your expertise. Unfortunately, there is just a little too much money involved in education these days. So it’s impossible for the reform movement to just admit they were wrong and walk away. They’ve got to double down. Of course, when they do, they rely on the same tricks as they used in the past. They create language that makes it virtually impossible to have an honest discussion. So let me walk you through their typical game plan. Step one: you create an organization with a name that makes the general public trust you. You know, like A+ Schools, Great Public Schools Now, or Project Renaissance. If you need a little help with the brand name, you can always call Proof Branding. They’ve got experience at this kind of thing. Once you’ve got your organization created, you need to adopt a platform. It helps here to be tired about all that arguing over charter schools vs. traditional schools. After all, you are above this kind of thing because you just care about kids. Your platform is about great schools for all and having quality teachers. Those two are going to allow you to attract parents, and that is the other big ingredient, parent voice. By being a champion for Parent Voice, you instantly have a Tizona to wield against those who would challenge you. Which is exactly what is happening in Nashville and why incumbent school board members withdrew from an upcoming candidate forum that is being sponsored by Nashville Rise, a sub-group of Project Renaissance, after not getting answers to their questions. 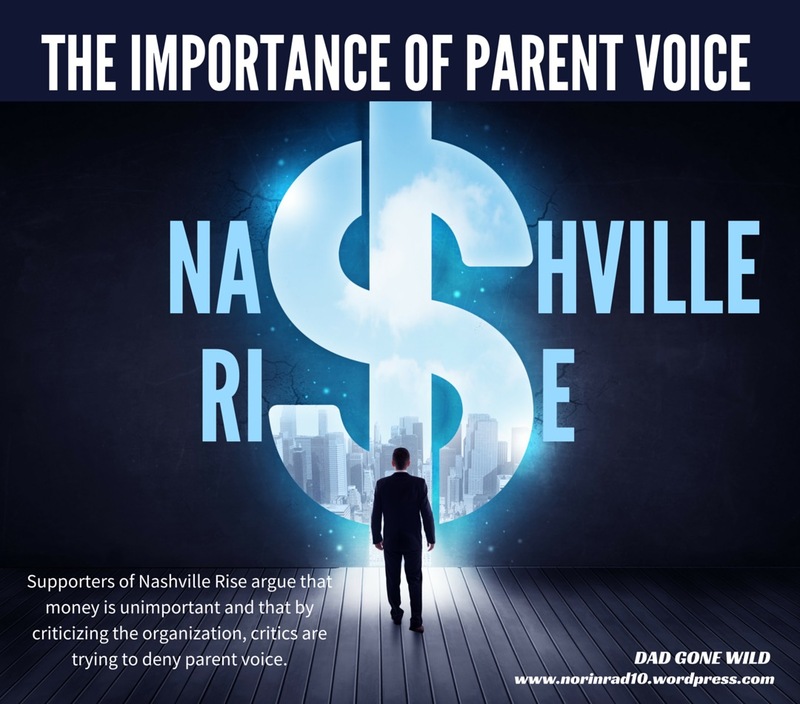 Supporters of Nashville Rise argue that the money is unimportant and that by criticizing the organization, critics are trying to deny parent voice. That’s a tough one to argue with, isn’t it? Especially when they throw out the caveat that every parent is an expert when it comes to their child. But how many of those parents understand the financial benefits involved in operating a charter school? How many of those parents are aware of how hard it is to track the extent of outside money in school board races? Or what other causes those benevolent donors support. What I am about to say is probably going to make a few folks mad, but if we are going to have that honest conversation, it needs to be said. To insinuate that every parent is an educational expert is ludicrous and a blatant attempt to play on parents’ egos. My wife, an educator, has a master’s degree in education. The principal at my kids’ school, a doctorate. The superintendent, a doctorate. Me? I read a lot of articles, talk to some teachers and other professional educators, and make some suppositions. Now I have a general idea of how my children are progressing and I have some things that I definitely want instilled in them, but do I suppose for one minute that I have the depth of knowledge as any of the aforementioned people? One reformer passionately declared to me, “I believe that every parent is smart enough to know what the best educational practice is for their child.” Notice what was done there? I never said they weren’t smart enough. I’m smart enough to repair my own car but do I have the time to learn to master that skill? You see, parents are busy being masters at their own careers and navigating day-to-day life, raising their children. So when are they supposed to understand the depth of pedagogy, child development, not to mention school budgeting and administration? Truth is, I think deep down parents recognize that we don’t have adequate knowledge about these issues, and we need to trust the experts to guide the process. Trust is never easy to give with our precious cargo. Especially when, in the past, educators haven’t always communicated in ways that made us feel like we still had some control. Trusting those we don’t know is very scary. Ask any mother or father who’s ever dropped off their child on the first day of kindergarten. It’s even hard to give when outside forces are bombarding us with messages of lazy teachers and failing schools, neither of which is accurate. When a parent doesn’t truly know the truth it is easy to accept a vision from, say, a former mayor or your local newspaper. It’s why a newspaper editor is asked to be the moderator. It gives the appearance that the program is endorsed by the local paper and we all want to believe what’s in our paper. But ask yourself, where do they send their kids? When have you seen them in your child’s school? How do they know what’s truly going on in my kid’s school if they are never in it? Truth is I’d feel better if the newspaper was giving the same level of scrutiny to the organization as they are to the candidates. It’s this fear that these reform organizations play upon. They throw out stats, like the one in the video above that states only 1 in 5 children in Nashville receive a quality education, without quantification. They paint a picture that gives parents the impression that their voice is important as they lead them down a preordained path. A path that leads to the dismantling of our public schools and turns control of them over to private interests. They’ll tell you that they are leading you down a path that leads to your voice being heard more. Talk to the people that have experienced this change and they’ll tell you a different story. One where their voice was ignored in order to implement the agenda of those private interests. . These outside interests play on parents’ fears by painting a picture of the school down the street to be a failure factory. Schools like my kids’ school, Tusculum Elementary School, are painted as being less than quality based on test scores that fail to paint a complete picture of the school. Charter proponents tell immigrant parents that the school is terrible, yet last year Tusculum moved 67 kids off of EL services. Double the number of last year. Does that sound like less then high performing to you? It is extremely important that groups that court parents operate in a transparent manner. Parent voice is only effective when parents have a complete picture and are left to make up their own mind. Imagine if a drug company had a product that had shown limited success financed the founding of a support group for cancer patients? What if they had a product they believed was effective despite its limited results in a controlled environment? A product that they had only been able to get limited approval on from the FDA. Wouldn’t it be vital that members of that support group were fully aware of the company’s vested interest and the amount of financial investment in the support group? Or would we just let people absorb the biased information under the guise of “supporting cancer victims” until they started to die off? It is in this interest of full disclosure that pseudo-grassroots groups like Nashville Rise need to be honest with parents and the community about their true intentions and purpose. Where the money comes from matters. Parent engagement is vitally important to the education debate. I don’t think it can be promoted enough, but we have to do it in a manner where we are giving parents a true picture. Local Nashville principal Dr. Sue Kessler has a recent blog post where she talks about not getting caught up in the distractions. I think that is extremely important, but equally important is pulling out the filters. Don’t allow people that seem to have a vested interest beyond educating your child sell you a false sense of goods. Remember, it’s got to be good for all kids and not just a few. Remember that education is a public commodity, and it has to benefit the community as well as the individual child. As long as you are honest in your motivations it is perfectly acceptable to fight as passionately as you can for the system you believe in, just don’t be afraid to acknowledge counter points on occasion, nor get your feelings hurt when people point out the flaws in your argument. And always remember that you can hate a person’s philosophy without hating them. I cannot stress enough the importance of going to the source for knowledge. Do you want to know why certain things are happening in your kid’s class? Ask their teacher. Want to know what’s going on in the school? Ask the principal. The same holds true for the district. I’ve never met a professional educator who didn’t relish an additional chance to educate. It’s funny when I look back on my kids’ admittedly short education careers. When I first dropped my daughter off for kindergarten, I was filled with fear and a desire to control every aspect. After working as a partner with her teacher, and asking the questions I felt important, that fear and need for control dissipated. There are still things I question, things I wish they did more of, and things I outright hate, but I’ve come to realize that my kids’ teachers and administrators are more interested in doing what’s best for my children and less interested in supporting the status quo. The conversation about public education has changed dramatically over the last several years. The public is a whole lot less gullible than they once were, but we’ve still got a long way to go. It begins and ends with accountability and transparency. Nothing can demand that like a parent’s voice. However, we as parents owe it to our children to use that voice in the most effective manner. Don’t let people paint educators and schools as your adversaries. In those buildings, you will find your biggest allies. In your educational journey, you may run across people who are difficult or seem less than ideal, but they exist in the non-education world as well; they are outliers and not the norm. Don’t let anyone convince you differently. Get involved in your child’s school. Talk to parents who have had children in that school for years – they’ll help you understand the big picture and introduce you to those who wield the most influence. It won’t all be perfect, but there are lessons in that too. By demanding that people’s actions match their words, we can improve our schools for all children. Next An Educated Parent Voice is a Stronger Parent Voice. TC, you clearly aren’t interested in honest dialogue as you engage in a heck of a lot of self-deception. 2. You mention cyber charters, as if that were a problem here. You are likely well aware that there are no cyber-charters in Tennessee. The only cyber schools are run by districts, and your reformer enemy #1 Kevin Huffman fought hard to close them for low performance. 3. You disparage TFA but fail to acknowledge that it has been the top ranked teacher preparation program by the Tennessee Higher Education Commission for several years in a row. 4. You decry money in politics but fail to honestly acknowledge the influence of teacher union money in elections at every level, going back decades. 5. Saying a school is low performing is not the same thing as saying that there is nothing good about it or that the teachers aren’t great people trying their best. That doesn’t change the fact that 96.5% of all elementary schools in the state outperform Tusculum elementary (according to last year’s TCAP results). And over the last four years the number of kids scoring proficient or advanced has fallen by 1%. I think we can and should do better for your kids and the rest of the families there. Its a travesty that they haven’t built you guys a new school sooner, the number of portables and the condition of that building is unconscionable, glad that is happening now. 6. Saying that parents should have a strong voice and know how to advocate for what is best for their kids is not the same thing as saying they are experts and know more than teachers/principals. Couple quick responses for you. As always, charter supporters want you you to ignore national trends and focus just on limited local results. While it is true that charters have been among the highest performers those results have not proven to be scalable despite charters being able to pick and chose their demographic. Let’s not forget the cost those high performers are inflicting on our traditional schools to get those results. I suggest you speak further with parents from Oliver, JT Moore and Croft to get a complete picture. All I have to say about TFA is that if they are so successful why are they being phased out by MNPS. What return did we get for our 100k a year expenditure? Are you really going to rank a school based on a testing system that we have not been able to execute properly for 3 years running? Seriously? Are you going to completely ignore the overwhelming data that shows testing reflects more about a child’s demographic and education level of parents then it does about actual learning? But of course you bring up the straw man of the teachers union which in TN doesn’t even have the ability to collective bargain for its members. Yet you fail to acknowledge the fact that you can’t even entertain being competitive in this race without raising a minimum of 50k. I think you’ll find I’m willing to have that honest convo anytime you want to bring it. I so very much agree with your article here and I am especially thankful for the last paragraph “wrap up”. I have one more child left in MNPS and he’s got 2 years to go. Lord have Mercy on our public school system! Thanks again for this wonderful blog!!! Wish every parent…well, everyone community member, really… could read this. This could be written about so many states, not just TN. We deal with this in IN constantly. Organizations like the “Institution for Quality Education” (I4QE) and their partner organization fear monger a lot and use the rhetoric you speak of – you can’t argue. Well said. I’ll share this post!